In the world of banking, necessity has proved to be the mother of contention. While banks have bristled at the regulations imposed in the wake of the Great Recession, they are stronger for having met those requirements. Many have amassed more capital to help ride out economic shocks. They’ve also exited risky proprietary trading. Scores of banks have downsized and simplified their operations to concentrate on core geographies and businesses. In general, banks are also less dependent these days on wholesale funding, which froze up quickly in the last crisis. Nevertheless, the volatility in global financial markets in recent months has exposed cracks in the system. With fewer market makers to smooth sudden, big moves, investors in equity and fixed income securities have found themselves trapped on a rollercoaster. According to business intelligence firm SNL Financial’s latest ranking of banks by assets converted to dollars, there’s been a major shakeup in the top tier of the biggest global banks. China now has four of the top five largest banks in the world, after weakening currencies pushed French and Japanese banks off the upper end of the list. The rise of Chinese financial institutions hasn’t particularly hurt global banks, which are largely shut out of the market in the People’s Republic. And Fitch Ratings says China’s recent sharp stock market correction is unlikely to substantially impact the balance sheets of Chinese banks or to pose a systemic risk to the global banking sector. Fitch notes that China’s banks are not allowed to grant loans to customers who intend to engage in margin lending. Direct cross-border lending by banks worldwide has declined as a share of total banking assets since 2008, largely reflecting a retrenchment by European banks, according to the International Monetary Fund. The pullback has been triggered by tightened regulations on banks’ international operations. Local and regional banks have stepped in to take up some of the slack, the IMF says. Those international banks that continue to lend across borders are doing so more often through overseas branches and subsidiaries than directly from the parent institution. “Strengthened regulatory frameworks are helping to make financial institutions and the global financial system more robust,” the IMF says in its latest Global Financial Stability Report, released in June. Cross-border lending flows are more sensitive to global volatility, whereas lending by foreign subsidiaries is more resilient, the IMF says. The Fund recommends a multinational banking model based on local subsidiaries, rather than a cross-border one directed from the home country of the lender. Foreign banks operating locally tend to pull back credit less than cross-border lenders following economic shocks in host countries, according to the IMF. Indeed, banks operating locally via subsidiaries or branches tend to be less sensitive to changes in capital flows owing to global contagions, it says. Still, cross-border lending helps to allocate savings efficiently, and there should be international cooperation on regulations and standards to make it safer, the IMF recommends. Meanwhile, intraregional financial linkages have deepened in Asia. The connections have heightened exposure of Asian banks to shocks emanating from within the region. Those ties have also ramped up the speed with which outside disturbances can spread throughout the region, according to the IMF. Higher net interest income and lower provisions and expenses drove the improvement in bottom-line results, Monteleone says. “Positive earnings, combined with smaller balance-sheet size, resulted in higher tangible common equity and fully phased-in Basel III capital ratios,” he says. Europe’s banks also reported impressive second-quarter earnings. On average, net income rose by 35% from the same period a year earlier. The European Central Bank’s July 2015 bank lending survey, covering the second quarter, showed that changes in lending conditions—and rising loan demand—supported a further recovery in bank credit in the euro area. Credit standards on loans to enterprises continued to ease in France and even more so in Italy. Competition was the main factor cited for the lowering of the borrowing standards. Conversely, emerging-markets bank lending conditions continued to tighten in the second quarter. The Institute of International Finance’s composite index for such lending conditions rose by 0.9 point in the second quarter but stayed below 50. That implies that bank conditions continued to tighten, albeit at a more moderate pace. “This worsening of supply conditions has largely offset more positive news of higher loan demand, notably in emerging Europe,” notes Felix Huefner, chief economist at the IIF. Senior executives at most financial services companies around the world appear to believe that their banks are well positioned to achieve strategic targets, according to consultancy EY’s review of key themes discussed during second-quarter earnings calls. Many also say they have the right business model in place to drive sustainable performance. The lion’s share of the banks included in EY’s report—which was released in August—recorded year-over-year gains in earnings, revenues and return on equity. That extended positive trends seen in the first quarter. Management at a number of banks said that macroeconomic challenges are easing or, at least, becoming more manageable, EY says. Challenges remain, though, most notably the resolution of legal and conduct issues and the cost of complying with regulations and potential new rules. In Europe, especially, the benefits of quantitative easing were evident in improved results. Managers at US banks continued to operate under the assumption that the Federal Reserve would begin to increase interest rates before the end of the year, according to the EY report. For the first time in many quarters, management at European banks commented on economic improvements—or at least stabilization—in the eurozone. The EY survey found that despite positive trends on efficiency, bank executives remain focused on expenses and cited elevated regulatory costs as one of the primary barriers in achieving further improvements. “Notably, the cost of compliance is a universal headwind for the industry, regardless of business model or domicile,” the professional services firm indicated. In addition, most banks would prefer to invest in their current businesses to drive organic growth, rather than making acquisitions, EY says. 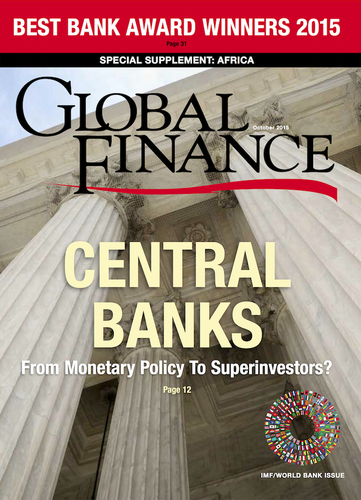 In our 22nd annual survey, Global Finance selected the best banks in 143 countries and eight regions of the world. We also identified the best global banks in various service categories. This listing includes the best banks worldwide for emerging markets, frontier markets, global custody, subcustody and Islamic finance. The winners in each category are being announced here for the first time. Other previously announced awards for corporate, consumer and investment banking, asset management for corporates, cash management, trade finance and foreign exchange are also featured. The winners are not necessarily the biggest banks, but rather the best banks—those with the qualities that corporations should look for when choosing a bank. These banks offer superior service, the most-effective risk-management systems and the best products. They constantly invest in best-of-breed solutions and staff to outperform their peers. We chose the winners based on performance over the past year, as well as subjective criteria, including reputation and management excellence. Global Finance made the selections after extensive consultations with bankers, corporate financial executives and analysts worldwide.